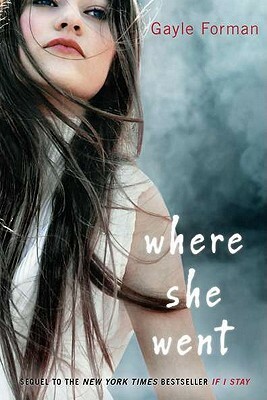 Book Review:Where She Went by Gayle Forman - Book.Blog.Bake. As soon as I read If I Stay back in February, it became an instant favorite. I connected with Mia so strongly, and my heart broke for her as she lost so much. The more I learned about her through her flashbacks and memories, the more I wanted her to be okay, and I was emotionally invested in the story by the time I reached the end. If I Stay was everything I wanted in a book, so I was eager to pick up Where She Went and learn more about Adam, the boy who had been so understanding and sweet over the course of If I Stay. By the time Where She Went takes places, Adam isn’t that understanding and sweet boy, but instead a broken, desperate character who longs for more than what he has. I understood where angsty Adam was coming from, but it was still hard to read. I felt like for so much of the book, he was just meandering aimlessly, both in his head and with his actual feet. I hoped it would get better when Mia came back into the picture, and it did, a little. I enjoyed the exploration of Adam and Mia’s journey and how the events of If I Stay didn’t just affect Mia’s life, but everyone’s around her. The events of If I Stay were tragic, but for the time being, they were contained in one book. We never really got to see what the outcome of Mia’s choice would be. I think Gayle Forman was pretty brave to write about Mia and Adam three years after If I Stay–it really explores the lingering effect that tragedies can have, and I think this was the aspect of the book I appreciated the most. As for the actual relationship progression of Mia and Adam, I just. . . didn’t feel it? I appreciated it, sure. I even enjoyed it, but I never really connected with this book, or this Adam on an emotional level. I wanted him to succeed, I wanted him and Mia to be happy, but I wasn’t going to walk away from the book feeling any differently if their fate had been different. I just wasn’t as invested. I know most readers seem to like Where She Went better than If I Stay, and while I can see why, I don’t feel the same towards this book. I liked it well enough, but I think I liked If I Stay for different reasons than some reviewers did. For me, If I Stay was all about Mia–I felt we were so similar, so it was hard for me to be as invested in Where She Went. Final Impression: This was review was pretty hard to write because I just left Where She Went feeling a bit confused. I liked it, but something was missing that was present for me in If I Stay. I think this was a book that was necessary for Adam and Mia’s story, but I didn’t connect with it the same way I did with If I Stay. I’d still recommend it, but it’s a 3/5 star read for me. You can find Where She Went on Amazon, Barnes and Nobles, or The Book Depository. A lot of reviews that I’ve read from these two books, say they enjoyed If I Stay better than Where She Went. I haven’t read either yet, but I hope to soon, to see where I stand in this discussion! The Sunday Wrap-Up! (6) | Book.Blog.Bake. As you know, I felt pretty similar to you in regard to this book. I couldn’t connect with Adam, and not so much with Mia. Their characters were interesting and, so far as I could tell, well-rounded, but they were lacking a spark that drew me to them. I actually liked Where She Went a little more then If I Stay. I don’t really know why. I defiantly connected with Mia in the first book, but I think I liked seeing the her and Adam interact again after such a long time away from each other. Plus I love stories that take place in cites…haha.